When the first Galaxy Note was introduced by Samsung, everybody wondered what exactly could the device do, as it wasn’t a regular smartphone mostly because of its huge size, but in the same time, it wasn’t a tablet either, because its small size which wasn’t specific for a regular tablet either. 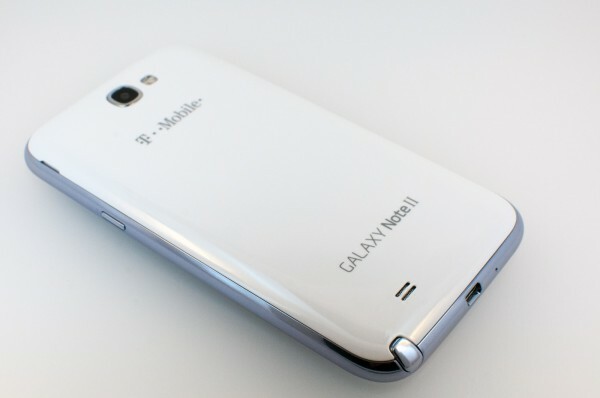 Instead, Samsung invented the phablet, a device which combines two of the most wanted devices on the gadget market. And despite the controversy which surrendered the innovative device, it ended up to be a success, Galaxy Note registering record sales around the globe, and because of that success, Samsung just revealed the Galaxy Note 2. And this is what we are going to analyze in the following review, starting from the outside and ending with its core. In order for you to get an ensemble picture of what this review is going to analyze, here is the exact order of the points we are going to talk about, so in case you have something to add or have different opinions regarding to the conclusion, feel free to discuss on the comment area. Samsung wanted to be different and with Galaxy Note, they really invented a completely new kind of devices, which incorporated a smartphone, a tablet a notepad, a planner and a great gaming platform. At first sight, is seems like they wanted to reach out a little bit of every consumers desire, giving everyone the chance to explore Galaxy Note by their interests. Like I’ve said before, the phablet started out a little controversy among traditional technology consumers, but soon they have realized the advantages of having all the desired devices in one medium sized phablet. Now there are still voices that are unhappy with the size of the phablet for a smartphone, but Samsung managed to find solutions for that issue as you are going to read below. When it comes to design, the Samsung Galaxy Note 2 looks and feels more like a smartphone rather than its predecessor, Galaxy Note, and that’s because, like we said in the introduction, many consumers were angry of the Note’s big size which made it uncomfortable to talk to. And to be honest, it was like looking back in 96’ when you could see the first mobile phones going out to consumers, weighting literally kilograms and which made your pants fall down. But it’s not the weight what made Galaxy Note hard to accept, it was the size of the phablet, which covers almost the whole face when used as a telephone. Galaxy Note 2 has improved this bad aspect by implementing additional accessories that help customers to deal with phone calls in a much pleasant manner. And of course, maybe we all got used to this new niche and we’re not looking so strange at people who’re talking on a 5.9 inches device. Still one downside of Galaxy Note 2 remains the increased size, which makes it tricky to use by small handed people, a category which cannot be excluded so easy despite the fact that some of them are fighting to keep up with the trends. If we think deeper, including the category excluded above would mean reducing the size of the display, transforming Galaxy Note 2 from a super phablet to a regular smartphone, which is not the goal that Samsung set. So let’s go back to the original idea: the design of Galaxy Note 2 remains in the same guidelines with it’s smartphone neighbor, Galaxy S3, thanks to the different approach of modeling the lines and edges. If you ask me, and let’s suppose you do, Galaxy Note 2 shows more style and value than its predecessor, but in the same time, it keeps the same classic “Galaxy” line that Samsung offered us. Thanks to its reduced wide and also by the fact that Galaxy Note 2 is a little bit longer, it makes it easyer to accept it as a smartphone while keeping the same functions as Galaxy Note, but on a whole different scale of speed. It has one physical button placed on the central-lower side, just under the display, again like all “classic” Galaxy line. On the upper right side Galaxy Note 2 has the front – facing camera and the display is framed with the white/black color of the phablet, depending on which one you like the most. As an improvement, the Volume Up and Volume Down buttons have been moved down a little bit, making them more accessible to use and this design improvement is one of the accessibility changes made by Samsung for those who find it difficult to handle Galaxy Note 2. Also we can notice the metallic aspect of the edge and even if from the pictures it looks like Samsung applied for a plastic – metal case, it is actually made entirely of plastic. Another plus for Samsung as they approached a futuristic combination of materials, when, in reality, they sticked to the old classic plastic cover. At the bottom of Note 2 we find the microUSB port which acts like a USB transfer data, a charger or video streaming trough the Samsung’s MHL cable. On the other side, upper side to be more specific, we have the power on or off button and also the phone jack plug in slot. On the back side of Galaxy Note 2, we can see the rear camera among with the flash LED, and on the lower left side we have the speakers. The back cover is made of thin plastic layer covering the battery. Even if for the back of the phablet, Samsung choose an ultra-thin plastic layer, when it came to protecting the 5.5 inches display, Galaxy Note 2 has a Corning Gorilla Glass 2 coating, making it more secure and less easy to scratch. Under the back cover hides the microSD card slot which allows you to increase the internal memory with a 16 – 32 or 64 GB without pulling out the battery. This easy access make it practical when you want to have access to the microSD card without having to turn off the phablet. 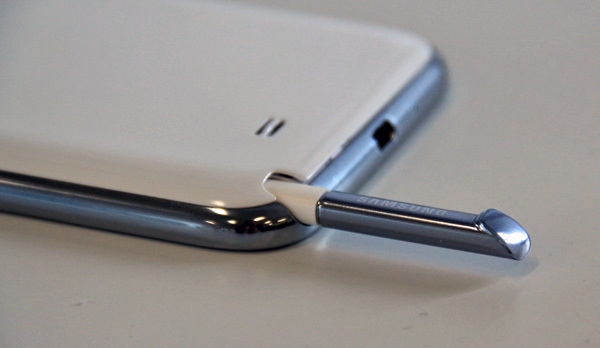 The S Pen stylus is placed on the lower right side of the phablet, and when it’s not used it keeps the metal line of the edge, as it has its pulling cap made of the same type of plastic. If you somehow use the S Pen stylus and forget to put it back in the hole, Galaxy Note 2 announces you once in a while and won’t stop until you’ll put the S Pen back into its place. And this is understandable as if you leave without having the S Pen stylus, the whole will be soon filled with all kinds of dust and small fabrics that you don’t want to get in there, and no matter how much you want to keep it away from these undesired trashes, they will get in there. You’ll see how Galaxy Note 2 knows when to announce you to stick the S Pen stylus back in the slot but we have an entire section dedicated to that. For the moment we’ll stick on saying that it is a good solution to prevent all these kind of undesired things to stick in there. Now we got the most interesting and important feature. It’s the one thing, which makes the Samsung Galaxy Note 2 different of any other smartphone or tabled launched. Thanks to the 140.9 mm or 5.5 inches display, this piece of device became a “phablet”, as we all know it. But what stands behind this huge display which make the Galaxy Note 2 so special? Well, first of all, it’s HD Super AMOLED feature display function capable of displaying resolutions as big as 1280 by 720. Also we have to mention about the 16:9 cinema – like viewing which gives you a whole new experience whenever you are watching a movie or a video directly from the Samsung Galaxy Note 2. After this kind of experience, you might throw away any bad thoughts which might came when you first saw the size of the phablet, and who know, maybe you will be a step closer into buying one for yourself! In other words, this is a multi – tasking device, which can satisfy all the needs a customer can ask from a smartphone or a tablet. It is built from the idea of creativity, and in order for you to express your ideas and creations, you need a big screen to put down any drawings or to work in multiple windows. It’s almost as it encourages people to express themselves trough images, taking elementary actions like cut, crop, copy and paste to a whole other level, being able to approach every type of person to become an artist. One other great improvement is the display’s time of response, which made Samsung Galaxy Note 2 much more reliable and giving it an aspect of closeness towards its user. Even if the first version of Galaxy Note had no problems with the display’s time of response, we can notice an improvement for the Galaxy Note 2, and considering the grounds from which this phablet started from, it’s a great way to point out the importance of this aspect. 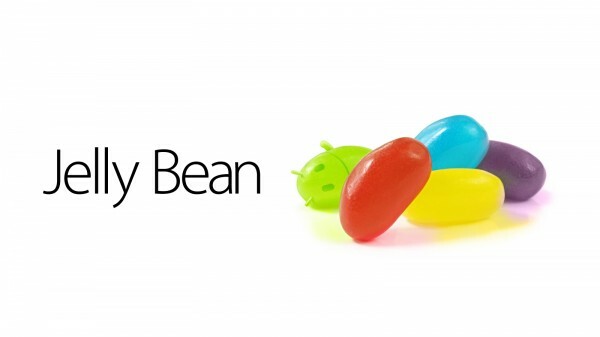 The Samsung Galaxy Note 2 comes packed with Android Jelly Bean 4.1. Now this is not the latest version of Android, we all know the update made for this version to Android 4.2, but when you buy it “in the box” you’ll find it equipped with this Operating System. What can the “Jelly Bean” do for you? Well, first of all, it provides you the freedom of expression, and not in a political way, but in the creative way we discussed before. It has new features which helps you to use all those new features implemented into the Galaxy Note 2, like copy – paste – crop –create – express – share. Those of you who had Galaxy Note, the first version, know that the OS plays a vital part in the whole app process and having an operating system which sustain some features will also improve the owner experience, making the time spend on the phablet more pleasant and fun. Android 4.1 Jelly Bean comes with a smoother interface and with an effortless movement between the home screens, comparable with turning pages in an ordinary book. Also Jelly Bean is helping the orientation changes which you make on the Galaxy Note 2 by changing its position from portrait to landscape and vice versa. You might be tempted to say that Jelly Bean was made for Galaxy Note 2 or that Galaxy Note 2 is made around the Android 4.1 Jelly Bean operating system. No matter how you look at it, it turned out to be an excellent combination and you will see that once you run your fingers on the phablet. 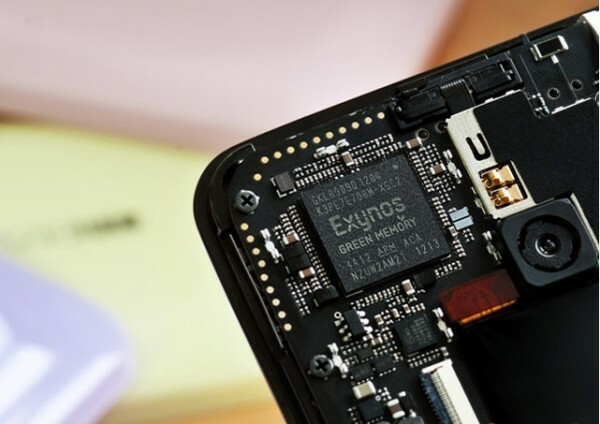 The hearth of Galaxy Note 2 is a 1.6 GHz quad core processor, which in the first phase, was rumored to be part of the Exynos 5 series and could be able to develops over 200% more speed than the A9 chips which were used for some well known super smartphones. In the end, Samsung has chosen the Exynos 4 series of processors, Exynos 4412 with Mali 400 GPU. In order to get some idea about the Exynos 4412 processor we have to take a peek at the benchmark test which was made for Galaxy Note 2. For the Quadrant benchmark, Smasung Galaxy Note 2 got 6547 points, which is an impressive result if we compare it to HTC One X ( with 4975 points ), Samsung Galaxy S 3 ( with 4888 points ) and its predecessor, the first Samsung Galaxy Note ( 4377 points ). For the Nenamark 2 benchmark, Galaxy Note 2 got 58 points which is the same amount of points that Galaxy S 3 got; the only chapter where Galaxy Note 2 made a very bad impression was the Smartbench 2012 ( Gaming ) benchmark where it was pulled down by its Mali 400 GPU who couldn’t compete against its much stronger rival Nvidia Tegra GeForce GPU. At that chapter, Galaxy Note 2 got 1641 points compared to HTC One X, which was the winner with 2608 points. Overall, we can see that Samsung Galaxy Note 2 is a phablet who stands proudly on the first position in most benchmarks proving that it is a device that can provide a solution for every task you might have for it. Well, except the gaming mode, but that is not as bad as it sounds because it is a device made for a whole different purpose than gaming. And I know some of you won’t agree with this policy, but let’s be honest, we can’t have a device who can offer excellent performances at all levels, or at least not yet! Samsung Galaxy Note 2 features an 8 MP rear camera with Auto focus which is quite a standard for high end smartphones which come from Samsung. It is not a “wow” camera but neither a camera which lets you down when you need it. One of the coolest features for the camera is “best face” which choose the best position of every person which is in the frame when you want to take a photo. So basically you can choose from a range of face pose and this is good when you try to take a picture of a small group of people, because we all know that “the perfect group picture” is just a myth. For the low-light conditions, Galaxy Note 2 has a flash LED and BSI which can be used both for picture shot and video recording. Also it has low light shot feature that brings quite an impressive improvement to pictures tooked in low light condition. As for the front facing camera, Galaxy Note 2 comes with a 1.9 Mega-Pixel VT Camera with BSI. Samsung Galaxy Note 2 can be purchased in one of the 3 models: the 16 GB internal storage, 32 or 64 GB. Also it has a microSD slot which can increase the user memory with another 64 GB. At this point, Galaxy Note 2 offers more than enough space for your storage needs of videos, pictures apps, music and other type of files. When it comes to RAM memory, Galaxy Note 2 has a 2GB RAM storage, which is common for the new generation of smartphones. With a maximum of 128 GB of user memory and 2 GB of RAM memory, I guess any kind of user can be satisfied! Standard Bluetooth 4.0, USB 2.0, direct Wi-Fi 802.11 a/b/g/n ( range between 2.4 and 5 GHz ), Wi-Fi HT 40 and S Beam. As for the Samsung apps: All share play and Control, All share Cast ( which is the WiFi display ) and All share Framework. As any high end device, Galaxy Note 2 includes: Accelerometer, RGB Light, Digital Compass, Proximity, Gyro, Barometer, A-GPS and Glonass. S Pen must be one of the most interesting aspect of the Galaxy Note 2 as it has a different concept from the original Galaxy Note phablet. Thanks to some micro-chip and sensors it is capable of providing an Air View aspect of pictures, text or even videos. Air View is basically an option trough which you can se a file or a text without leaving the main screen, and it acts like a pop-up, and it saves you time for not having to open each piece of text or picture. Less actions means more time to explore. The S Pen has a longer and more ergonomic design and has a rubber tip which assure you that the display won’t be scratched while navigating through the menus or while you draw. The most important feature is the Music Player with Sound Alive. Also, Galaxy Note 2 can be connected to a 3.5 mm Ear Jack. It supports almost all types of audio files. 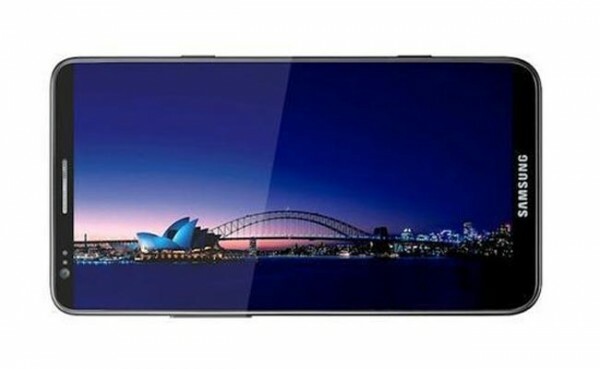 The most important feature for the video section is the Full HD 1080p Playback and Recording, which comes as a natural thing when we think about the huge 5.5 inches Super AMOLED display. The phablet supports all types of video files and can play large amounts of videos which were either recorded or imported. It has 80.5 mm by 151.1 mm and 9.4 mm thickness, weighting only 180 g.
I am amazed by the performances of this phablet and as I am not such a smartphone-games fan, I can live with the idea that Galaxy Note 2 is not the best at the gaming chapter. After all, the project started from different conceptions and it is quite impressive to see how they could incorporate so many cool features into one device. If you can go over the first impression regarding its “huge” dimensions, then you can really start to enjoy exploring all the features offered. I see Galaxy Note 2 as a phablet which can satisfy various needs and let’s be honest, that’s what we are all looking for.